Around 3,7 million afghan refugees have returned to their homecountry since the fall of the Taliban in the end of 2001. Many of the returnees are living under horrible conditions in the capital Kabul. Families lives in ruins bombed during the sivil war, without any heating, electricity, water or santitation. In Pakistan, there are more than 2,4 million afghans still living as refugees. The number of returnees has been dramatically declining the last year, both because of the fighting in southern Afghanistan and because the afghans remaining in Pakistan have become an integrated part of the pakistani society. 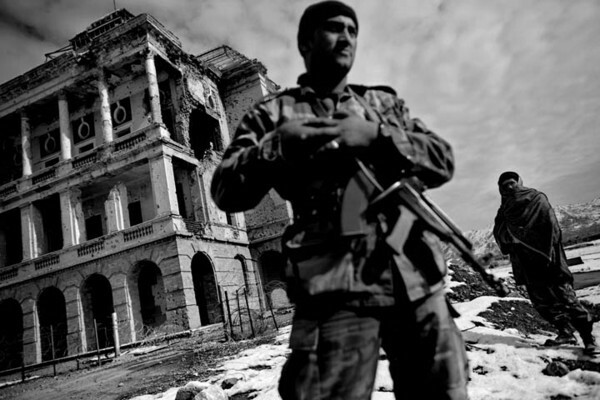 The bombed presidential palace in Kabul, guarded by afghan soldiers. Kabul, Afghanistan, December 7, 2006. Espen Rasmussen, "The Return," in POYi Archive, Item #46207, http://archive.poy.org/items/show/46207 (accessed April 18, 2019).